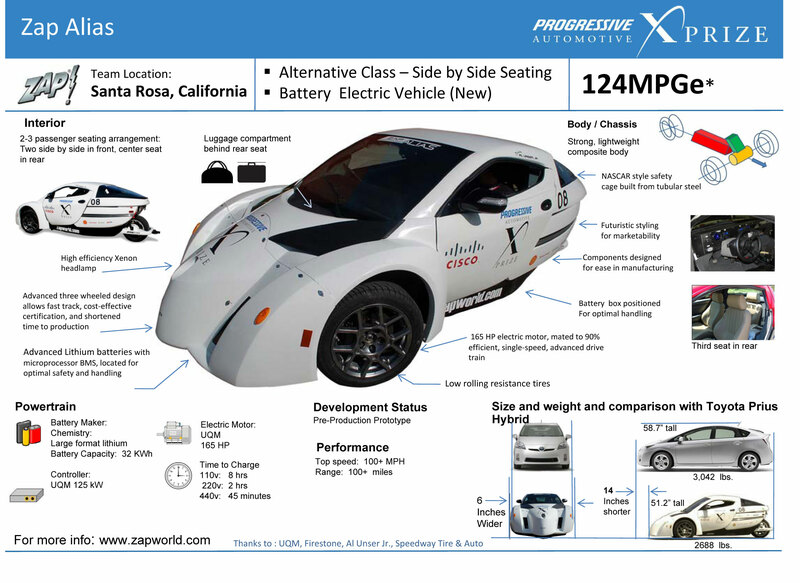 ZAP’s approach in the Progressive Insurance Automotive X PRIZE was to create a sleekly styled, 100% plug‐in electric roadster designed in a three‐wheeled configuration, two wheels in front, one in the rear. 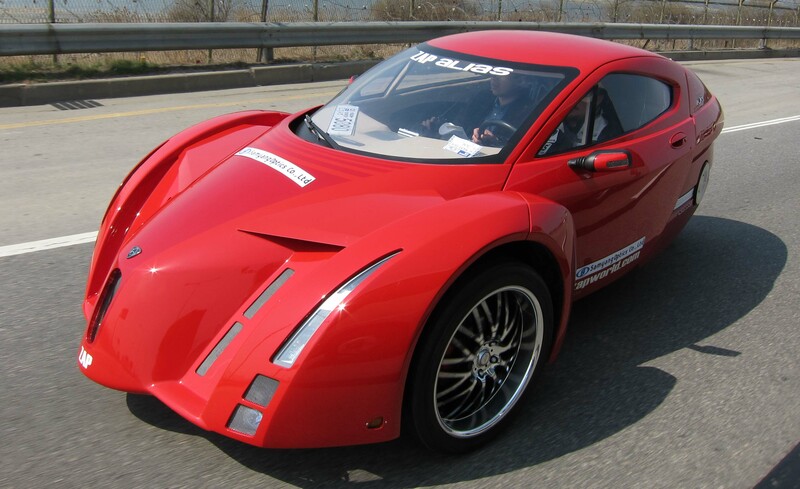 The 2‐ (optional 3) passenger vehicle employs unique automotive design and manufacturing techniques in order to achieve ZAP’s business goals of practicality and affordability. Production plans are to sell the Alias for approximately $35,000. transportation problems, ZAP has been a pioneer in providing cost effective advanced transportation solutions and helping to create a paradigm shift in transportation. In 16 years ZAP has designed, manufactured and shipped over 117,000 electric vehicles, ranging from electric bikes to electric scooters, ATVs, cars, vans and trucks, to over 75 countries. 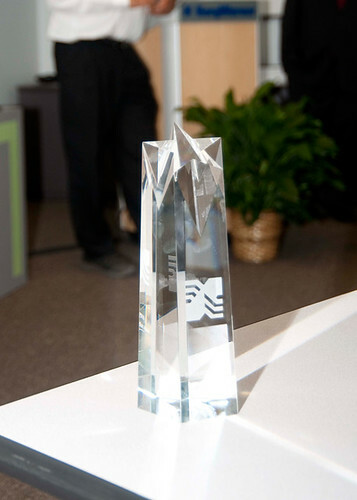 What Does the Progressive Insurance Automotive X PRIZE mean to them? The timing with the Progressive Insurance Automotive X PRIZE could not a better opportunity for ZAP and its plans with the Alias. 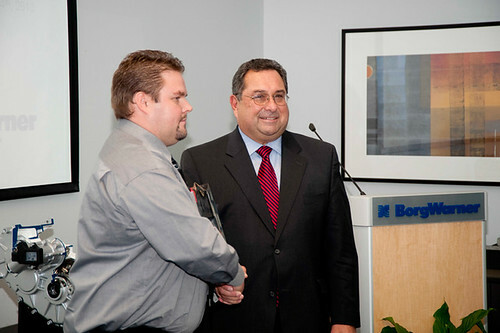 Meeting competition criteria for the PIAXP and following their guidelines and advice is an asset that far exceeds the investment in the competition. The X PRIZE’s goal of creating an advanced vehicle that could be readily produced was in synch with ZAP’s corporate goal. Design, safety, production, marketability, performance —many of the things the traditional auto industry look at when bringing a vehicle to market—were key areas of focus for the XPRIZE and ZAP in the making of the Alias. The 100+ MPGe is an added challenge that makes the competition a unique opportunity in the history of the auto industry. 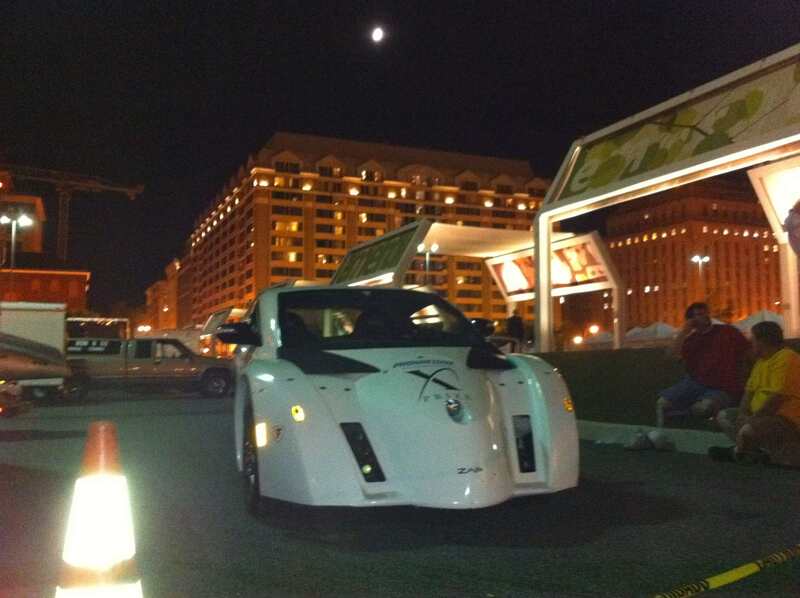 ZAP Jonway Alias Electric Car last night in Washington D.C.
WASHINGTON, D.C. (September 16, 2010) The Alias electric car from ZAP Jonway (OTC BB: ZAAP) will be participating in two events in Washington, D.C. on Thursday, September 16, 2010. From 10:30 AM – 12:00 PM, the Alias will be featured as a finalist in the Progressive Insurance Automotive X PRIZE Awards Ceremony at the Historical Society of Washington D.C. From 2:15 to 2:45 PM the Alias will be presented to U.S. Department of Energy Secretary Steven Chu. WHERE: Historical Society of Washington, D.C., 801 K Street NW at Mount Vernon Square, Washington, D.C.
WHERE: US Department of Energy, 1000 Independence Ave. SW, Washington, D.C.
What’s Al Unser Jr.’s Take on EVs? When you have been racing IndyCars your whole career, perhaps you would be ready for a change of scene? 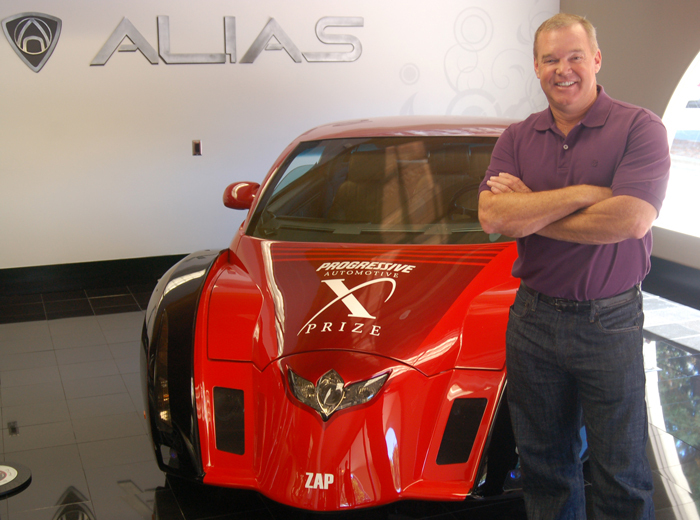 So many have been curious about Al Unser Jr.’s attraction to driving the ZAP Alias electric car in the Automotive X PRIZE and we examine some of his recent interviews. 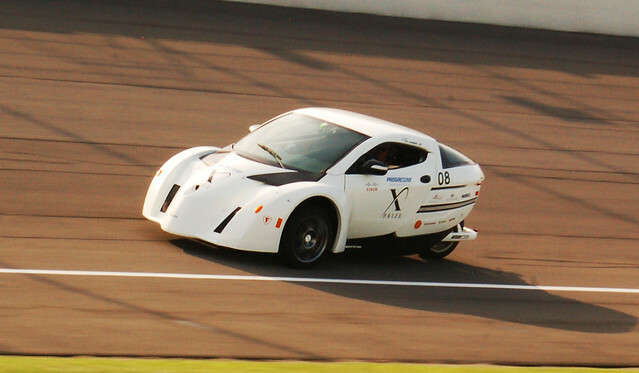 As Edmunds.com writes, the race for the 100 MPGe Automotive X PRIZE is ‘oh so quiet‘ and this is part of the attraction for Unser. Earth2Tech asked Unser if he missed the roar of the engine? “Not at all,” says Unser. Many have speculated that Unser is doing it because it is the green, environmental thing to do. Perhaps they don’t know Unser very well, nor his family, who have been driving all kinds of automobiles and pushing automotive innovation for over 100 years. EarthTechling looked into Unser’s latest interest: electric cars. Also, long-time Unser fan Ronald Ahrens spent some time on the ground with the man at Michigan International Speedway. Learn more about the racing legend and why he’s so charged up about EVs.